Who Do You Think You Are Kidding, Mr Coleman? On 15th September, I wrote a blog praising Dad’s Army fan Brian Coleman, whose excellent piece in the Barnet Press extolled the virtues of old fashioned respect for community and civic institutions. Brian’s latest column, entitled Thank God For The Boys Brigade, praises the role of the uniformed youth services and the values they espouse. Credit where credit is due, this is one of the best articles Brian has written for a long time. In between these two great journalistic endeavours, however, is a somewhat bizarre Press Release in which Brian calls on Mayor BoJo to ensure that the 2012 Olympic medals are struck in the UK. Given Brian’s well known antipathy towards the Olympics, many people will question whether he has undergone a damascene conversion, or if this is simply a damage limitation exercise following his previous unwarranted attack on the British athletes returning from Beijing. The reality is, of course, that even if we wanted British made medals, Gordon Brown has flogged off most of our gold reserves on the cheap so we probably don’t have enough of the precious metal left. Unless, perhaps, Brian is willing to melt down some of his ceremonial bling for the cause? I have been accused by some characters of bringing the Conservative Party into disrepute, so let me be amongst the first to congratulate Barnet Councillor Lynne Hillan who was today elected Chairman of the London Councils Grant Committee. Well done and good luck! This committee meets up to four times a year and I am sure Lynne will be worth every penny of the £5,299.32 allowance that comes with the job. Just one question. According to the Press Release, Cllr Hillan “has a business background as founder and MD of a marketing firm.” Can they be referring to Ashurst Direct Marketing Ltd, which went into creditors liquidation in September 2006 with debts of more than £121,000, including £10,650 to the taxman? The Barnet Times recently ran an article which set the alarm bells ringing. Fortunately, an extremely helpful officer from Barnet Homes was able to put the record straight and bring down my blood pressure! Under the headline “Measures introduced to help (the) hard up” the article referred to council schemes to help residents suffering from the credit crunch. It also mentioned that grants of £29,000 were available for people to buy their council homes. My initial reaction was to wonder how on earth giving tax payer’s money to council tenants could help Barnet residents suffering from the current economic depression. It turns out that the credit crunch help measures and the housing grants were two separate issues which somehow appeared as one article in the paper. But this still left another question unanswered. Why was the council making grants available for tenants to buy their homes when they were already entitled to discounts under the Right To Buy scheme? Again, the newspaper article gave a slightly misleading impression. The council officer explained that the Cash Incentive Scheme (or CIS as it is known) is a distinctly separate scheme from Right To Buy. Under CIS, a grant is paid to tenants to move out of council housing into private accommodation, thereby releasing their property for another family. You can’t apply for a discount and a grant! But then came the real shocker. Apparently, CIS has been operating in Barnet for nearly 20 years which means that it was Margaret Thatcher’s government which brought in the legislation that allows hard working taxpayers to subsidise council tenants buying their own homes. Who would have ever thought this possible from the woman once dubbed the milk snatcher! So if CIS has been around for 20 years, why is it being publicised now? Has the council taken a leaf out of Labour’s book and decided that re-announcing an old decision will divert attention away from the TV scandal? Or the laptop scandal? Or the bridge scandal? You might agree with those objectives. But equally it could be argued that CIS only serves to create a culture of dependency by sending out the message “stay in your council house for a few years and then we will pay you to go somewhere else.” How does that encourage people to be financially responsible and save up for their own home? By enticing tenants to move into the private sector, they are being encouraged to take on mortgages which they might not be able to afford. Is Barnet not at risk of fuelling the sub prime crisis? The Council has set aside £600,000 for CIS this year. Last year 21 grants were awarded at an average of £26,000 each. At a similar level, we could be looking at around 23 or 24 grants this year. In the current climate, where every penny counts, is it really appropriate to spend such a large amount of public money helping such a small number of families? £600,000 could be used to help far greater numbers struggling to pay their council tax or heating bills. Or it could buy wide screen televisions for residential care homes. Or the council could simply not spend the money at all and give everyone a well deserved break. This is supposed to be a tax cutting administration after all. Conservatives have criticised Gordon Brown for creating a client state economy in order to effectively buy votes. It is hard to see how CIS is different. I think you got this one wrong Maggie! 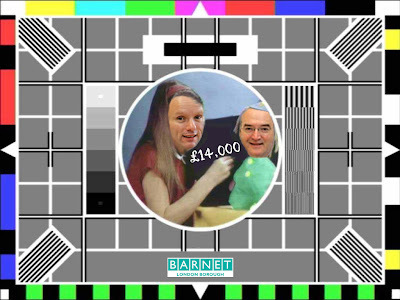 As families all across the country tighten their belts and cut back on non essential luxuries, it is reassuring to know that the recession has not hit Barnet Council which spent £14,000 of taxpayers money on televisions for five Chief Officers, as part of a contract for audio visual equipment worth over £91,000. You may have already read about this appalling extravagance in the Barnet Press or on local resident’s Rog T’s blog in the Barnet Times. One resident suggested that the expenditure was obscene. Frankly, it was worse than that. It was grotesque. Inflation is rising. Unemployment is rising. Pensioners are being forced to choose between heating and eating, but Chief Executive Leo Boland must still have a 46” wide screen television in his office. Has he no shame? 1. Who authorised the expenditure? That doesn’t answer the question! Who was the officer? Why does the council refuse to publish a schedule of works and a budget which includes the expenditure on televisions? Why do they refuse to disclose which meeting of the Cabinet Resources Committee approved this expenditure? If the minutes of that meeting were available, we would instantly be able to ascertain whether councillors knew that they were approving expenditure on televisions for chief officers or whether the costs were buried amongst other items of expenditure. Not properly explained? That’s a bit of an understatement. On page 164 of the budget in question, there is a reference to HE01 with the commentary “IT costs including desktop and applications, data and voice networks, internal cabling and communications.” To suggest that this can include televisions is manifestly absurd. It is equally absurd to suggest that this expenditure was approved by councillors. A source close to the Leader told me “I’m a councillor and I didn’t know we had bought any televisions.” Well how would they know if the budget only mentioned IT and voice networks? What have they got to do with a 46” wide screen Sony TV? This is not the first time that council officers have buried significant expenditure in the accounts. On the face of it, there is an arguable case to bring a charge of false accounting against whoever was responsible for the cover up. 2. Did the council obtain competitive quotations? Under contract procedure rules, the council is obliged to seek three written quotations for contracts over £75,000 in value. Did they do so? It appears not. Absolute nonsense! It is quite common for a contract to be invoiced in several parts. To suggest that each invoice is a separate contract is a clear absue of power in order to avoid contract procedure rules. Competitive quotations are necessary for a good reason. When you look at the invoice for the televisions, it is quite clear that the council paid way over the odds for the equipment. But what did they care, it was not their money? 3. Was the supplier given a written contract? For some reason, the council is refusing to answer. It is not exactly a difficult question. Contract procedure rules clearly state that a written contract must be provided in all cases. If such a document exists, why does the council refuse to release it, as this would prove that the rules were complied with? It would seem that either the council is deliberately withholding information from the public, or there has been a serious failure of management control. It certainly appears as if some aspects of the contract have been carried out unlawfully. But the ball is in the council’s court. If they cannot or will not provide the documentation to prove that the purchase of the television equipment was properly authorised, then there will be no alternative but to bring this whole matter to the attention of the Audit Commission. One of the most disturbing aspects about this, however, is that whilst Labour and the LibDems condemned the expenditure, Tory leader Mike Freer told the Barnet Times he thought it was justified. Not one Conservative councillor has said publicly that the council was wrong to spend taxpayers money on televisions for chief officers. Privately I know that many of them are outraged. Perhaps they are all too afraid of Freer to say a word against him in public? But come election time, they will have to answer to the voters. A councillor’s duty is to the electorate first and foremost, and if they continue to remain silent, the public will conclude that they simply did not care about taxpayers money being frittered away. One of Tony Blair’s few decent achievements as Labour Leader was to end the politics of envy. Indeed, Blair seemed to idolise those with a few bob in the bank. Given that the Conservative Party Leader and his wife are both reported to be in line for a modest inheritance (but not for a long time, we hope) I wrote to David Cameron to ask him if he supported Cllr Freer’s comments. In a somewhat terse response, a spokesman for Mr Cameron replied: "I cannot comment on the personal views of Cllr Freer on this case." Cllr Freer can try and spin his way out of this, but it is clear that his views are completely out of step with David Cameron, George Osborne and the entire Conservative Party. Barnet Councillor and GLA Member Brian Coleman has been doing his best recently to disprove P.T. Barnum’s theory that any publicity is good publicity. First was his reported tantrum when he was overlooked for a senior position on yet another taxpayer funded quango. Then he made a somewhat disparaging and unnecessary outburst against the successful British Olympic team returning from Beijing. With even London Mayor BoJo distancing himself from our Brian’s remarks, were the wheels about to come off the gravy train that provides him with £87,500 a year in allowances? Well fear not, dear readers, because in his column in this week’s Barnet Press, BC proves that, deep down, there is a real Tory in there somewhere. The article talks about Dad's Army and the concept of community and respect for local civic institutions - two good old fashioned virtues which were once the mainstay of traditional Conservative philosophy. Unfortunately, Brian did not go on to say why such institutions are now held in such utter contempt by the electorate, so I will proffer a simple explanation: the public have been completely disenfranchised by the political classes and the political process. The old system of local government had worked well enough for generations, but Tony Blair’s first government ignored the old adage “if it ain’t broke, don’t fix it”. At a stroke, the committee system was out and the cabinet was in. Without any public consultation whatsoever, vocational councillors were replaced by highly paid professionals. Previously, important decisions were taken by committees made up of the great and the good. Today most councillors don’t even get a look in. Unelected officers have more power than them. Councillors never used to be professional politicians. They were ordinary members of the public who stood for election out of a sense of civic duty because they had something to contribute to the local community. It was a noble cause. Allowances were extremely modest at a few hundred Pounds a year. Today we have a generation of politicians who look only at what they can get out of the system rather than what they can put into it. The minimum a Barnet councillor receives is £9,735 a year (for which he or she need only attend two meetings) and this figure can rise to more than £47,000 if you stab your colleagues in the back, get to be leader and then change the rules which previously limited how many special responsibility allowances you could claim. It now costs Barnet taxpayers more than £1 million a year to pay for councillors’ expenses. But what do they actually do for the money? Just as Westminster has been neutered by Brussels, so have our Town Halls been neutered by Westminster. Central government dictates key policy matters and instructs councils as to how our money is to be spent. There are 63 councillors in Barnet. Do we really need that many? Traditionally the reason for three members per ward was to ensure that the workload was spread out. But when you consider that (a) the officers do all the work, (b) the public no longer need to attend surgeries to ask councillors for advice or to make a complaint and (c) most councillors are not actually involved in the decision making process, one councillor per ward is more than sufficient. The changes to local government brought in by Labour have not improved governance. Rather, the opposite is true. The Local Government Act 2000 has driven out of office those possessed with a lifetime of experience, achievement and success, to be replaced by career politicians who put obedience to the party whip above service to the community. To restore respect for our political institutions, the public - and the public alone - should be allowed to decide what form of local government we want, and how much we are prepared to pay for it. Easier said than done, of course, but not impossible. The 2000 Act provides for the election of a directly appointed Mayor. If enough electors demand a ballot (I think the figure is 10,000), then the council is forced to hold a referendum. The election of a Mayor would fundamentally alter the balance of power in the Borough because it would mean, for the first time, that the head of the Executive is directly accountable to the voters. Imagine that! At present, the leader is only accountable to the councillors in his/her group and the wishes of the public can be totally disregarded or dismissed with impunity if the ruling party so chooses. I will come back to the question of an elected Mayor in a future blog because I am convinced the time is now right for such an election. The democratic deficit in this country - let alone the borough of Barnet - is increasing at an exponential rate. Politicians need to be reminded that they are elected to serve, not to rule. Today we bid a fond farewell to “Not The Barnet Times” and welcome instead Barnet Council Watch. When I started this blog at the end of July 2008, it was in response to an article on the Barnet Times web site written by Mill Hill resident Rog T. His piece was entitled “Barnet’s very own Stalinist Mr Bean” and criticised council leader Mike Freer. The blog was subsequently removed by the Editor who decided that it broke their rules. It was an excellent article and, in my opinion, the paper made a mistake by removing it. Hence, Not The Barnet Times was born. What happened next surprised me. Instead of constructive criticism of Roger’s article, a number of anonymous postings appeared criticising me for posting the article. And there was I thinking that we lived in a democracy! It was clear that the article had struck a raw nerve. But if you are a politician - and especially so if you are the leader of a council and wish to become an MP - you have to accept that not everyone will think you are wonderful. Not everyone will bow down before you. Some people will have a contrary view and, what is more, they have a right to say it without being abused. A few articles later and it was clear that Mike Freer’s cage was well and truly rattled. How could I, the anonymous councillor wrote, criticise Cllr Freer when we are both members of the same party? Well, we might be in the same party, but only one of us is a Conservative. There are many loyal party members who, like me, believe that scrutiny of the decision making process within Barnet Council has effectively been neutered resulting in a total lack of democratic accountability. In short, the Executive and Chief Officers are out of control, and if you believe in democracy then you have a moral duty to speak out - even if that means criticising members of your own party. The Local Government Act 2000, brought in by Labour, has shifted power from the 63 elected representatives on the Council to a small secretive cabal which includes non elected officers. Whatever the intentions of the Act, it has failed miserably. I would be delighted if this blog became redundant. But for that to happen, it requires the 53 non cabinet councillors to do their job properly, re-assert control and hold the Executive to account. Until then, welcome to Barnet Council Watch. On 15th August 2008, I posted a blog entitled 14,000 Cheers For Mike Freer. This article may have given the mistaken impression that the esteemed leader of Barnet Council received allowances of approx £61,000 per annum, comprising his council allowance of £47,082 and a new allowance of £14,000 from the London Development Agency quango. A senior member of the council contacted me to advise that Cllr Freer is also a member of another council-tax payer funded quango - London Councils. Cllr Freer is required to attend one meeting a month and receives an allowance of £10,248. Mike Freer is therefore entitled to approx £71,330 a year from the public purse. I am happy to put the record straight and apologise for any embarrassment caused to Cllr Freer by selling him short. Of course, at £71,000 per annum Cllr Freer is still some way behind fellow councillor Brian Coleman who rakes in over £87,500 (or half a Boland to use the correct terminology) from his council, GLA and LFEPA positions. Who needs to be cosseted by family money when it is so much easier to live off the backs of hard working taxpayers? Where is Barnet’s Sarah Palin? Like many people in the UK - and probably even in America - I had never heard of Alaskan State Governor Sarah Palin until a few days ago. Now she is in all the papers and quite likely to become the next Vice President of the U.S.A.
No sooner had her nomination been announced, than her opponents tried to trash her reputation by publicising that her unmarried teenage daughter was pregnant. Of course, this would never happen in Barnet where our enlightened leaders show such tolerance of those with whom they disagree. Governor Palin’s subsequent speech to the Republican convention simply blew her opponents out of the water. She talked about vetoing $500 million of unnecessary state spending whereas in Barnet we spent £1.4 million on near obsolete computers and a further £28,000 to put them into storage because they weren’t all needed. We spent £14,000 buying wide screen televisions for chief officers. Sarah Palin cancelled the vanity construction project dubbed “The Bridge To Nowhere” to save taxpayers money whereas in Barnet, our Bridge To Aerodrome Road is over budget - reportedly to the tune of £4 million. The Cabinet Member for Resources responsible for this fiasco (Mike Freer) doesn’t want to us to know how much more of our money is needed to finish the work and has buried the cost in a secret report. So much for an open and honest Administration. Governor Palin sold the private jet bought by her predecessor. “I got rid of a few things in the Governor's office that I didn't believe our citizens should have to pay for," she said. "That luxury jet was over the top. I put it on eBay." Compare that to Frequent Flyer Freer who spent almost £3,000 of taxpayers money on a business class ticket to San Francisco to attend a management training course claming he needed to fly luxury class “because you get a place to work and it allows you to arrive fresh and ready to go straight into the classroom” - even though his flight was on a Saturday and the course didn’t start until the Monday. Until now, I had not been particularly impressed with Senator McCain’s election campaign. However, his choice of running mate was inspired and might prove to be the catalyst to ensure a Republican victory in November. If not, Governor Palin, who is already being dubbed as America’s Margaret Thatcher, would be very welcome to move to Barnet. What a pity that the council is completely bereft of inspirational Thatcherites to take over from Mike Freer when he steps down in May.